The pea and bean weevil is a horrible little creature called Sitona lineatus. It is quite small (5mm) and hard to spot, but its damage to peas and beans is easy to see: neat half-round notches cut out of the edges of the leaves of young plants. Damage from pea and bean weevils. 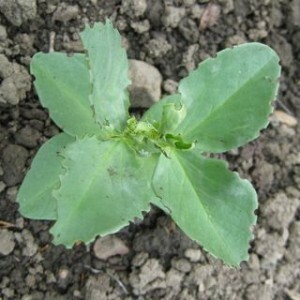 They overwinter in the soil near peas and beans (and winter tares), and come out in warm weather. They lay lots of eggs on the host plant during May, June and July, and the tiny larvae then find their way into the soil and feed on the roots. They are annoying, but don’t usually cause serious damage. The best advice seems to be to keep the young plants well fed so they can outgrow the danger, as the weevils don’t climb very high. Rotating your crops helps, too.